Austin, Texas is noted for live music and creative artists. And stunning hand-dyed, uniquely-patterned fabrics, by Malka Dubrawsky. Touring her studio, I was reminded of my color theory class, studying Josef Albers. In between wedding and celebrations, Colleen, who hails from Nova Scotia, made arrangements to meet Malka at her studio, A Stitch in Dye. Colleen is an avid quilter and follows Malka’s blog. The four of us piled in Joanne’s car and her son Chris, ferried us to A Stitch in Dye where Malka welcomed us and generously gave a tour of her studio. Malka explained the dye process. We learned about the addition of soda ash. Joanne spotted these gloves on a shelf. Thanks J. Custom designs available and international shipping! Click for her Etsy Store to see samples of her vibrant hand dyed fabrics. She has written two books. Color Your Cloth: A Quilter’s Guide to Dyeing and Patterning Fabric and Fresh Quilting: Fearless Color, Design, and Inspiration. Thanks for a wonderful tour. Malka saw us out to the parking lot. Glad Colleen had such a cool connection in Austin. The fabrics she bought were richly colored and fabulous designs. Can’t wait to see your quilt creation, Colleen. Send photos for upcoming blog post! I hang onto with my best grip. 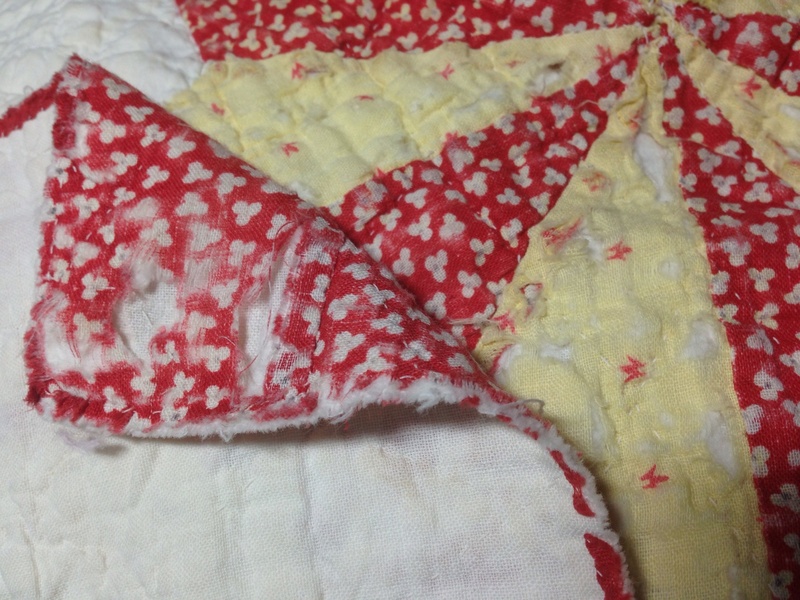 yellowed muslin quilt my grandmother stitched decades ago. Farmersville, Illinois She’s the one who taught me to knit when I was four. 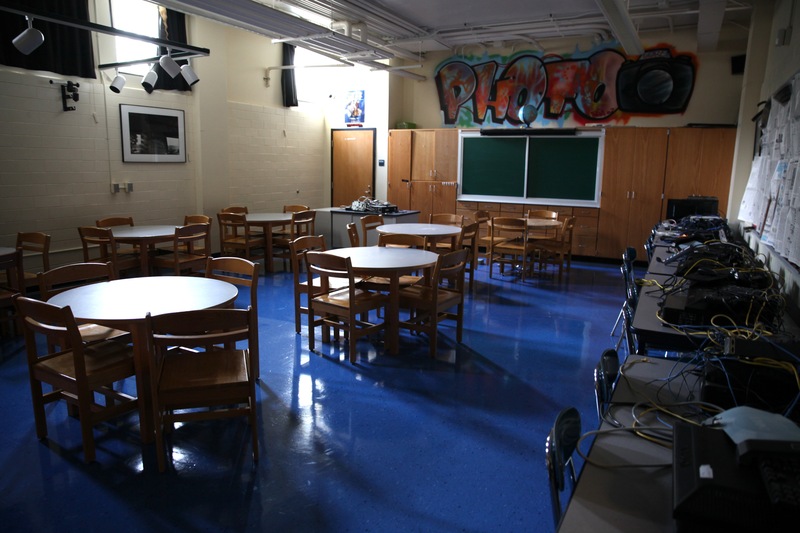 The classroom is ready. I’m jumping in. 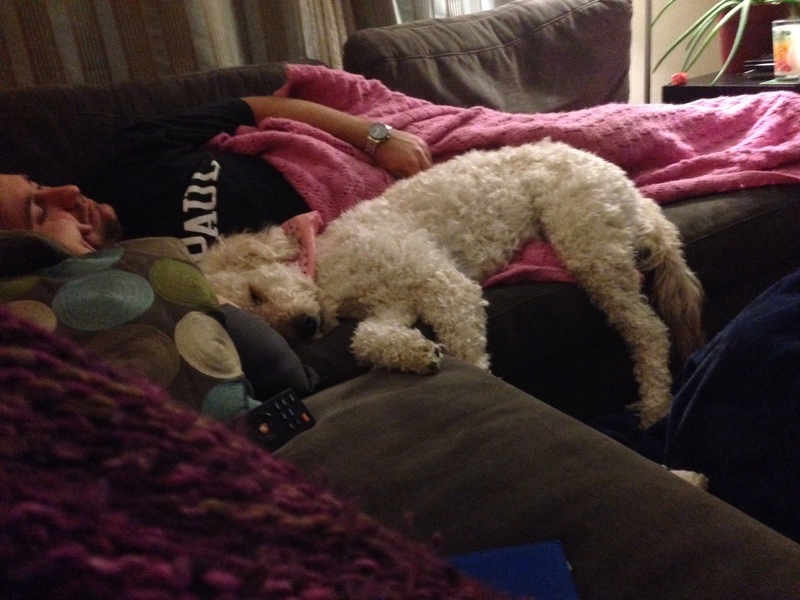 My son-in-law James and Penny the Golden Doodle, exhausted! James was happy with the results of two games (Ohio State and Auburn winning) and said he didn’t care much about the last one- USC and UCLA. He gave me permission to blog the two of them resting on the couch. Laura had already headed to bed. I went down the street to photograph a crazy Christmasy house lit up full force but they’d flipped the off switch early and gone to bed. Thought that would have been good for the Let There Be Light challenge part two. The pink afghan covering James has a label in it from my father’s mother Mary Alta Hendricks, who knit it in 1976 at age 84. Born in 1892. That was a long time ago. I’d been knitting all evening while the games were on. Earlier in the day, my granddaughter Anna and my daughter Laura had been knitting as we all sat on the same couch. Passed down four generations. There’s another afghan my grandmother knit from Bobbie, she sent it to Laura and James. 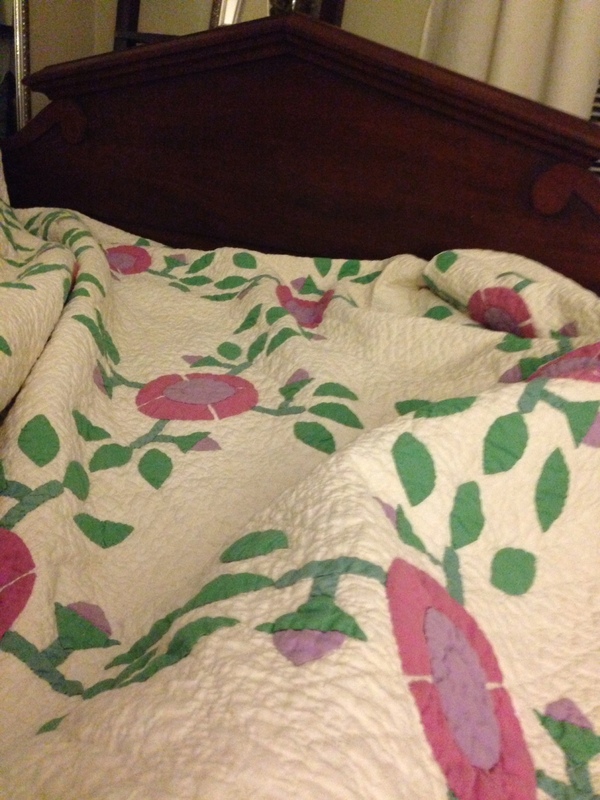 Tonight I am in the guest room at Laura and James’ sleeping under a quilt my grandmother stitched. Thinking of family as the holiday weekend comes to a close. Grateful for all the love passed down. Thinking of those nearby and those no longer with us on earth, just in our hearts.